AA: 6.5%-8.5% A signature dual purpose variety of the English brewing tradition. Challenger excels for boiler, hop back, and cask additions. 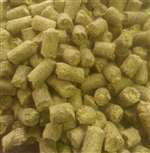 Right at home in any English ale formulation, it has also found application in some west coast-style American IPAs. Challenger imparts a fruity flavor and a clean bitterness when added early to the boil, the flavor and aroma feature cedar, green tea and sweet floral characteristics (as a late addition, it can provide crisp, fruity flavors) with mild to moderately intense spice with elements of ripe fruit. As a dry hop, Challenger adds a bright, grassy character, marmalade, lemon. It blends well with earthy or floral varieties. It is typically used in English-Style Ales (ESBs, porters, stouts, and brown ales) and Lagers from the UK. Challenger is popular in English beer, it was bred at Wye College using Northern Brewer and a German variety as well as Northdown and Target in 1961. It is a dual use hops with a moderate alpha acid rating of 6.5%-8.5%. Challenger was released in 1968 was intended to provide high alpha acids, good aroma as well as disease resistance.